Thank you "obie-wan-kenobi" and "Bob K" for your great posts. I learned a lot about engine performance. "35 cents per gallon". Hmm. I wish I could return to "those days." Don't forget a can of spray starting fluid to shoot in through the air cleaner. And don't buy a DeSoto if you expect the carb to work in winter . My father would never buy a Buick because "they're gas guzzlers." We were a Plymouth family. Bent Nickel, the cars from the '50s & 60" were in fact gas guzzlers because they were inefficient in engine design, having energy wasting 2 and 3 speed transmissions, no overdrive and poor aerodynamics. 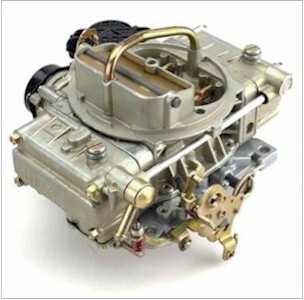 Fuel injected carburetors were introduced in 1984 on Ford cars in their 5.0 liter (302 CID) and 3.8 Liter (231 CID) engines and were called CFI injection (Central Fuel Injection). While GM continued using poor performing "computer controlled" carburetors for several more years, Ford and the Japanese auto companies began taking the lead in fuel economy and performance by applying this new electronic fuel injection technology. The technology in today's engines runs circles around what was available back in the '50s through the early 80s. For example, a Ford 302 cubic inch engine in 1974 delivered about 134 horsepower. Today the same 302 displacement engine can deliver 300-400 horsepower and with a 6 or 7 speed automatic transmission still can get you 25 MPG on the highway. I enjoy reading the "conversation" but, I know ZERO about automotive technology. My question: considering the new "fuel injection" carburators that arrived on the market, was it early 1980s (?) my question, were those vintage auto beauties of the 50s and 60s deserving of being called "gas guzzlers" ? I agree with obi-wan-kenobi, I loved repairing carburetors, Most of my buddies liked Holley Carburetors, Me, I loved Quadrajets. Once I had them adjusted, no problems, not like the Holley's, you were constantly adjusting them. I drove a 1966 Chevy Belair in the 1990's (it was sharp & with low miles). One morning the linkage got stuck on the 2-barrel Rochester and the engine was racing like a madman. I quickly popped open the hood, unscrewed the air filter housing and began to fix the problem. It took a minute or 2 but I fixed it. When I turned around there was a police officer standing next to me (I actually got jumped because with the engine revving I didn't hear him drive up and exit his squad car). I asked,"What is the problem officer?" He said a neighbor called and complained that a teenager was racing his car engine ! Ha Ha.....fooled her ! I was in my 30's ! I became a master in my ability to make automatic chokes work perfectly on all Rochester, Carter, AFB, and Autolite (Ford) Carburetors. Holleys were always a pain to get right... the adjustments changed day by day. Give a person born in the 80's a car with a carburator and they'll never get it started in the morning. Holly's were easy to adjust, but you had to adjust them frequently. Plus they had diaphragms that would rupture if you backfired through the carb. A quadrajet was a pain to adjust, but it stayed adjusted for a long time. Those old carburetors on the old cars from the '40's and '50's, I recall adding a spoonful of water. 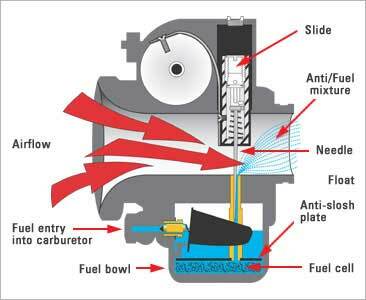 When raising the RPM up a notch adding the water would steam clean the upper part of the engine.